Mamadou “Zoto” Kamara was laid to rest yesterday afternoon, just a few days shy of the two-month anniversary of his brutal demise. The 32-year-old Malian died after receiving multiple blows to the groin, shortly after he had been captured by detention officials following an attempt to escape from Safi detention centre. Three men, all members of the Armed Forces, have been charged in connection with his murder. 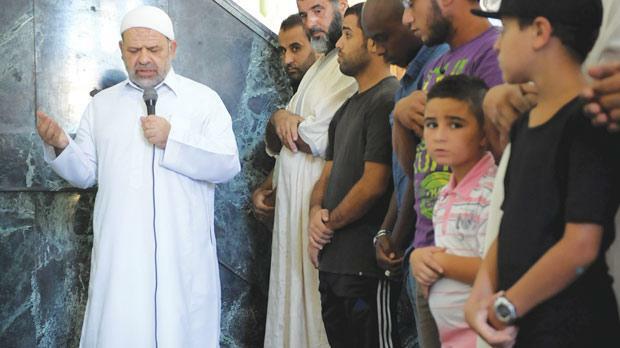 Members of Malta’s Malian community were informed of the funeral on Monday. And although Mr Kamara’s cousin could not make it back from Italy in time for yesterday’s funeral, a 100-strong group of people gathered at the Paola mosque to pay their last respects. Mary Agius, 35, the mother of Mr Kamara’s nine-month-old daughter Sata Mary, was also there, together with many of his friends. A visibly bitter Ms Agius railed against Mr Kamara’s assailants. She recalled how Mr Kamara, who worked in the construction industry, would give her €150 a month to help raise his daughter. “We had split up just after I got pregnant, but we soon made peace. According to court sources, Mr Kamara’s body was cleared for release on August 13, three days after the police commissioner filed a request to do so. It is not known why the funeral was only held yesterday, two-and-a-half weeks later. The delayed start to yesterday’s funeral was more easily explained, with Mr Kamara’s hearse being held up in traffic caused by ongoing road works in Marsa. Muslim prayers were followed by a few words by Imam Mohammed Elsadi, who decried racism as “unjust, inhuman and immoral” whatever its source, motive or target. Thanking the government, Armed Forces and detention service for their hard work, Imam Elsadi also offered asylum seekers his solidarity. “I am Palestinian... I was a refugee too, so I know what it means. Nobody wants to leave their country,” Imam Elsadi told The Times later. Mr Kamara was buried in the Mosque’s burial grounds, his shrouded body lowered sideways into his tomb, in accordance with Muslim tradition. Men rushed to help pile layers of dust onto the body, with large stone slabs then smeared with multiple layers of concrete to seal the tomb shut. Funeral expenses were paid for by the government – a welcome piece of news forthe refugee community, which had spent the past couple of days scrambling for the necessary funds. And in a statement, the government offered its condolences to Mr Kamara’s family and friends and assured them that the review of the detention system currently underway would lead to “graduated yet significant changes”. “We cannot but reflect on this sad occasion as to the importance of ensuring such incidences do not happen again,” the statement noted. As the congregation petered out, Mr Kamara’s nearest and dearest set off for Marsa open centre, to celebrate and reminisce about their departed friend. Ms Agius and baby Sata Mary were there, too. “My parents no longer speak to me because of the baby’s skin colour,” she said sadly. “It’s been tough, but we’ll get by”.